This book with a very long title will have readers laughing throughout. A compelling blend of fiction and fantasy, it takes readers to a very unique and unusual setting, one that will remind fans of Tennyson's Lotus Eaters of another dream world with a powerful spell. The plot may seem very straightforward and simple from the beginning, but readers soon understand that there are many twists in it and that the narrative is character-driven. Three men, Kurt, John, and Mac, are escaping after a successful bank robbery. They stop in a village called Musicarolina and it is here that their troubles begin. They might have been lured into a place they were not supposed to be, a very strange place with strange, nice people who easily burst into song. But then when night falls, they begin to understand that they have been trapped in a deadly place with demons, criminals, and monsters. How can they begin to negotiate for an exit and can there be any exit for them? MUSICAroLina: A Tale of Monsters, Demons, Criminals and Fabulous Musical Numbers! by Daniel William Gunning is simply spellbinding. There is a lot to enjoy in this debut. First off, I loved the author's creativity; the originality of the story will startle many readers. One gets the feeling that one is reading a symbolic tale, but it feels so real because of the wonderful character development. When I turned the last page of the book, it felt like a dream and I couldn't help but turn back to re-read some stanzas of the beautiful poem in the very first pages of the book. The characters are awesome and readers will love the way they reveal themselves through natural dialogue. From the very beginning the conflict seems to develop around three men who just want to get as far away as possible from a crime scene, but it quickly intensifies and becomes transformed into a nightmare. What does Musicarolina signify for the characters and the readers? Perhaps this could be the toughest question to answer after reading this fabulous work. MUSICAroLina: A Tale of Monsters, Demons, Criminals and Fabulous Musical Numbers! by Daniel William Gunning is a great success and I must say I have never read anything like it before. 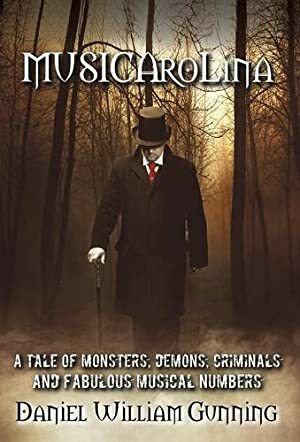 In an amazingly original and fantastic new book by author Daniel William Gunning, MUSICAroLina: A Tale of Monsters, Demons, Criminals and Fabulous Musical Numbers! is a story that grabbed me from the very start and kept me obsessively reading all the way through to the very end! Follow the story of three bank robbers on the run who stop for the night in a town that turns out to be quite a bit more than meets the eye. The citizens of the town are oddly perfect and have the strange habit of breaking into song and dance numbers at any time. When it comes time to leave, the robbers find they cannot, and they also find that the town that seemed so strangely innocent during the day has quite the darker side at night. Will they ever escape? You'll need to read the book to find out! I so enjoyed MUSICAroLina: A Tale of Monsters, Demons, Criminals and Fabulous Musical Numbers! Author Daniel William Gunning has a truly unique voice in the area of supernatural fiction, which is something that is becoming more and more difficult to find. His intermixing of music in his fiction was unusual and added a whole new sensory experience to the read in my mind. Any reader who enjoys supernatural fiction, chills, thrills or just a fantastic read of fiction from a clearly talented debut author should absolutely read this book. I am so pleased to be able to highly recommend MUSICAroLina: A Tale of Monsters, Demons, Criminals and Fabulous Musical Numbers! and look forward to more from author Daniel William Gunning as soon as he has something available! MUSICAroLina: A Tale of Monsters, Demons, Criminals and Fabulous Musical Numbers! by Daniel William Gunning is a compelling, hilarious story that takes readers on a ride to a fictional world inhabited by weird characters. Having just robbed a bank and leaving dead bodies behind, swimming in pools of blood, John, Kurt, and Mac are driving away, hoping to meet someone who should be waiting for them at the end of the road. But they land in a place where nothing seems to be what it is. A small town called MUSICAroLina, with storybook images of buildings, demons, and weird citizens with an unusual fondness for singing in unison. It could have been fun navigating through this weird world, but for the fact that the robbers seem trapped with no way of escape. Could this be a nightmare they will wake from or could their lives be doomed? Daniel William Gunning's writing left a powerful spell on me, a spell I felt right from the very beginning with the descriptions of an idyllic place. But then the introduction of the key characters was wonderful. Readers may not enjoy reading about bank robbery and stealing, but these characters are so real it will be difficult for the reader not to pay attention to them. The dialogue is so realistic too and the reader can form a very clear picture of what is happening. Readers who are into poetry will enjoy the poetic songs in the story, a work of great art and imagination. MUSICAroLina: A Tale of Monsters, Demons, Criminals and Fabulous Musical Numbers! is a hilarious story with compelling characters and a plot that is so original and symbolic. It is a masterpiece. MUSICAroLina: A Tale of Monsters, Demons, Criminals and Fabulous Musical Numbers! by Daniel William Gunning is a captivating story of three bank robbers, John, Kurt, and Mac, who find themselves in a strange village after escaping from a robbery scene. They might be running to safety from the police, but it seems they can't run away from themselves. There is worse to come: they find themselves in a place with no escape and soon realize that there could be danger everywhere they turn. How long will they be here and can they survive long enough to realize what it takes to escape this strange place with its eccentricities, criminals, demons, and citizens giving in to fabulous musical numbers? The story will pull the reader in immediately. Why? The author opens with powerful and vivid descriptions and the reader can't ignore the characters. There are well-crafted dialogues, the kind that flow so naturally the reader feels as if they are listening to people talking in front of them. The author demonstrates great literary prowess by creating a setting that is tantalizing, plucking the reader from his own world and thrusting him head first into a strange one. One can't overlook the symbolic nature of this story which confronts the characters with the mystery of life and the choices they make. The writing is gorgeous, tight, with captivating phrases that ring through with lyricism. Readers will love the characters; they are real and memorable. I also enjoyed the way the author combines humor with suspense to create interest. Yes, the reader will have a lot of entertainment with this one, but there are many instances where thought will be called for. For a debut novel, this one is very successful and I will be looking forward to more writing from this author who writes from a place we have all visited in our dreams. MUSICAroLina: A Tale of Monsters, Demons, Criminals and Fabulous Musical Numbers! by Daniel William Gunning is very entertaining and a breezy read. MUSICAroLina: A Tale of Monsters, Demons, Criminals and Fabulous Musical Numbers! is a paranormal thriller written by Daniel William Gunning. As intriguing as the title of the book sounds, the plot is equally captivating. Musicarolina is a place where people begin dancing and singing whenever and wherever they feel like doing so. At first glance, the citizens of this place seem friendly and normal, except for their singing and dancing, of course; however, as the time passes, the visitors to this strange land begin feeling uneasy. When three bank robbers, John, Mac, and Kurt, enter Musicarolina, they couldn't possibly imagine that this "short detour" would turn so ugly so soon. According to the people of Musicarolina, whoever enters this place can never leave. John and his friends laugh it off, thinking nothing of it at the time, but soon they realize that this statement might have some truth to it. One thing that captured my interest right from the first page of Musicarolina is the author's incredible writing style. The dialogues of the characters bewitched me by the spontaneity of the words. Sarcasm played a major role in most of the conversations and that felt extremely realistic. While reading the book, I could imagine the dedication of the author and the ease with which he placed himself in the shoes of his characters. Nobody can write such sarcastic and engaging dialogues without truly immersing themselves in and becoming one with the plot. This dedication is very visible, even while he brings the characters to life by aptly describing their appearance, behavior, and daunting pasts. Although John is the leading character, I admired Kurt due to his loyalty to John and his ability to lighten the mood every now and then. The plot develops with enough twists and songs. With the vivid scenes of violence occurring here and there, music seems a welcome change. The author has done a great job in coming up with the lyrics of many songs, and these have provided many useful insights into the mental condition of the characters. The story keeps going from the present to the flashback (at the time of robbery), but it was never boring or confusing. The clear writing helped me to remain with the story until the end. Musicarolina is definitely a page-turner. If you have a stomach for the graphic scenes of blood, and you are searching for a good paranormal fiction filled with plenty of surprises, then this is the book for you.